With less than six months to go until the end of construction, 2019 will be the biggest year yet for UTS Central! Since the installation of the intertwining ‘double helix’ stairway, UTS Central has reached a number of key milestones. The building ‘topped-out’ to its full 17-storeys; the glass façade made up of around 3,600 panels has been carefully installed; and in February mature olive trees were craned in to outdoor terraces on levels 8 and 17. We are currently on track to open the first public spaces in mid-2019. In the coming months, here are the remaining major milestones expected on the road to completion and beyond. Eight vendors are close to being confirmed for the food court. Watch this fly-through and get a taste of things to come. Whilst construction work is on schedule to be completed by mid-July – with technology commissioning, relocations and fit-out works ongoing – the building won’t be completely occupied until 2020. However, all external hoardings will be down by July, allowing us to fully appreciate the building’s striking glass façade and integration with Alumni Green. Come late July, the first public spaces on levels 3 and 4 will open their doors. The key attractions will be the food court, a Careers and Student Services hub, and extensive informal learning spaces. Rising from the Jones St entry on level 4 up to level 7, a staircase designed to emulate a double helix will also be a must-see. Conducting research with real impact on the wider world is a priority for UTS, but research needs the appropriate environment. That’s what we’re creating for the Faculty of Engineering and IT, who will relocate research teams into custom-built spaces on levels 10, 11 and 12 of UTS Central in the second half of 2019. A key destination will be the new UTS Library, due to move in mid-November to minimise disruption. Sprawling across levels 7, 8 and 9, it will relocate from Haymarket and feature space for around 120,000 books, two spacious terraces, a books lift from the underground library storage, and access to the scholarly Reading Room. In early 2020, the Faculty of Law will take up residence on the top floors – levels 14, 15 and 16. Commanding spectacular views, Law’s facilities will include a purpose-built Moot Court and two Trial Court facilities, which replicate real-life courtrooms. The final piece of the UTS puzzle will slot into place in March 2020, when the level one Science Super Lab opens, ready for the start of the autumn teaching session. Known as the Hive Super Lab owing to its hexagonal worktables and the anticipated buzz of activity, it is designed to physical containment level two (PC2) and will be able to accommodate up to 270 students at once. The new UTS Central Building will be home to the UTS Library, Reading Room overlooking the Alumni Green, Faculty of Law, Hive Super Lab, research space for the Faculty of Engineering IT, and a food court. 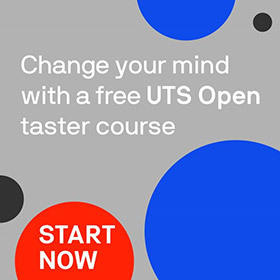 UTS is inviting our alumni to make a gift towards our new library and reading room, to ensure students and the Ultimo community can continue to enjoy these world-class facilities for generations to come. Support the library of the future. This article was originally published by UTS Campus News. Read the original article.